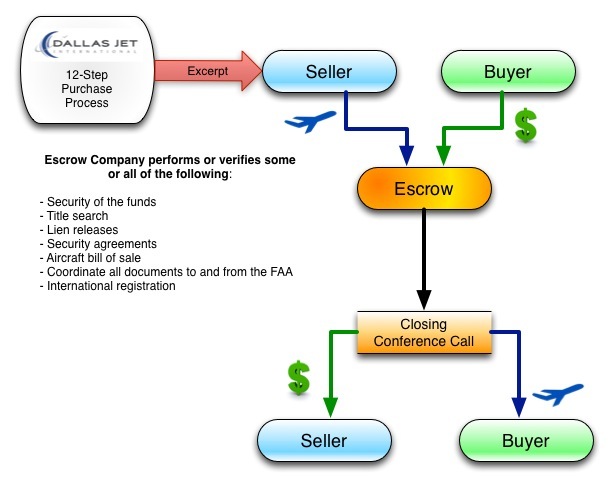 Aircraft pricing is a complex process that can seem mysterious to aircraft buyers and sellers. It can be particularly frustrating for those who don’t work in the aircraft market daily. There are many disparate pieces of information that factor into the aircraft pricing strategy. DJI has a uniquely thorough process that provides for more accurate and credible pricing. Our reputation for following a detailed process often avoids delays and surprises in the negotiation stage. Our first-hand, accurate information also ensures we have better control throughout the sales process. We consult with the seller regarding his priorities, including timing required for the sale and any other factors. We perform a very detailed history of the aircraft, including equipment, maintenance cycles, engine status and so on. We go on site and take “amateur” digital photos, looking for specific technical details. We engage a professional photographer to do more aesthetic photos that showcase the interior and exterior of the aircraft. We analyze the logbooks and equipment documentation, compiling a complete history and marketing package. We research specific major repairs and alterations (Form FAA 337) and STCs (Supplemental Type Certificates) that may be required for specific equipment. After evaluating the specific aircraft on-site, we use the data and photos we have collected for market research. We look at every similar aircraft that has been sold in the previous 12 months for sold comparisons. We subscribe to several services, which provide pricing data for recently sold aircraft of a similar type, age and condition. In addition to this reported data (these are the figures they call “comps” in the real estate industry) we call other brokers to determine the actual sales price and any other circumstances related to the sale. For every aircraft we sell, someone on our team (Shawn Dinning, Ralph Crosby, or I) have personally touched the aircraft and reviewed the logbooks and records. Many times, those on-site, hands-on analysis provide great opportunities to tell the deeper story of an aircraft and find opportunities and factors that can showcase the real value of the aircraft. In these comparisons, there are many apparently small factors that can have a large impact on pricing. Of course, we share this data and our recommended pricing with our client, and work toward pricing that will balance their need for a timely sale with the objective of selling the aircraft for the highest legitimate price under the circumstances. Our use of this consistent, detailed process contributes substantially to DJI’s credibility in the marketplace. Other professionals understand that what we say about an aircraft comes from our experience as pilots and aircraft owners, and from having personally seen the aircraft and verified the relevant facts. We won’t be surprised during negotiation with something we should have researched in our Due Diligence. We also won’t be surprised by the revelation of market data. We can speak to the concerns of the buyers and the stakeholders on his team, whether they are pilots or mechanics, or legal or accounting professionals. This offers our sellers significant peace of mind, knowing the transaction will take advantage of every favorable factor the circumstances provide. Almost all aircraft sales professionals tell you that they perform “due diligence” to help the aircraft seller get the very best possible outcome for the transaction. And yet, few of these brokers or consultants will tell you what this “due diligence” is composed of! 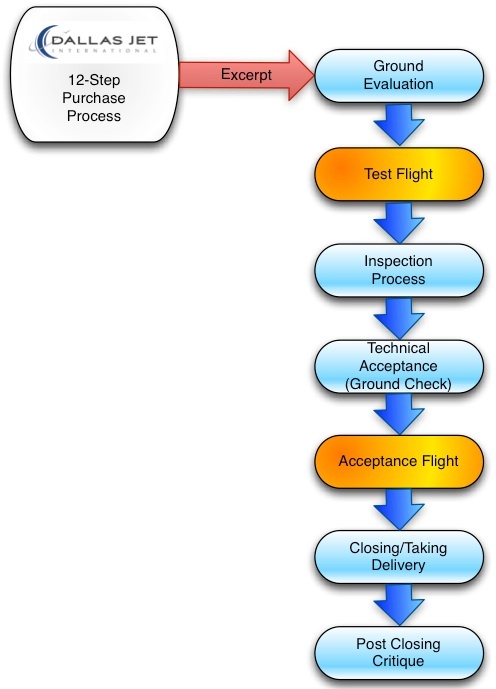 Keep in mind that Due Diligence is the first in the twelve major steps in our Aircraft Sales Process. Each of the twelve steps includes numerous additional items. 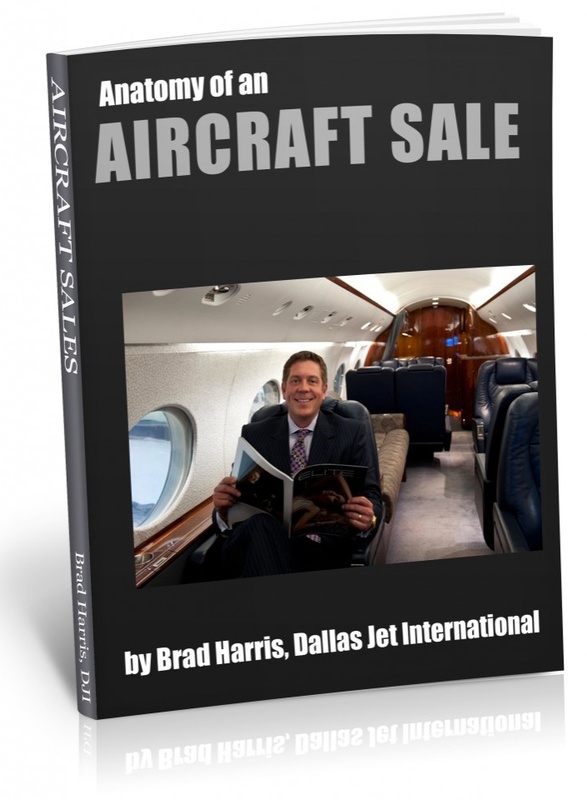 Download Anatomy of an Aircraft Sale for a high-level overview of the entire process. Some of these high-level processes include over a hundred steps. What are your objectives for the sale? Do you have any needs or preferences regarding the timeframe for this sale? 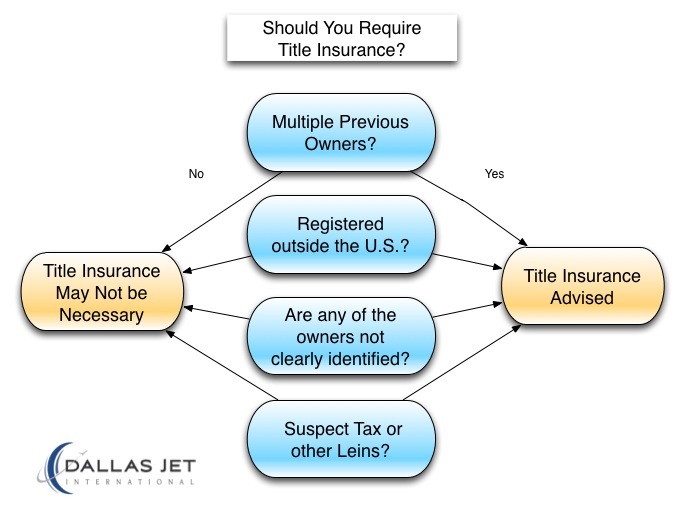 Is it your intention to trade, upgrade, or sell the aircraft outright? What are your financial expectations or needs for this sale? Every transaction involves balancing certain priorities. As an example, if a sale must take place quickly, that reduces our negotiation options for obtaining the best price. Our philosophy is that aircraft sales is more about people, priorities, and great communication than it is about airplanes! It is only by taking the time to clearly understand our clients priorities that we can obtain the best results and their continued loyalty and referrals. Investing the time at the beginning of this conversation saves us, our clients, and others in the industry significant time and frustration in the long run! 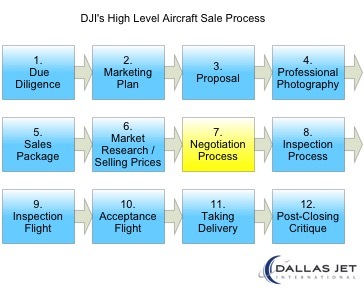 While many aircraft sales professionals do most of the work “virtually,” DJI is committed to doing business in person. (Read more in this article.) Brad Harris, Shawn Dinning or Ralph Crosby visit every single airplane that we represent. Our commitment to doing business in person is an important part of our reputation in the field. 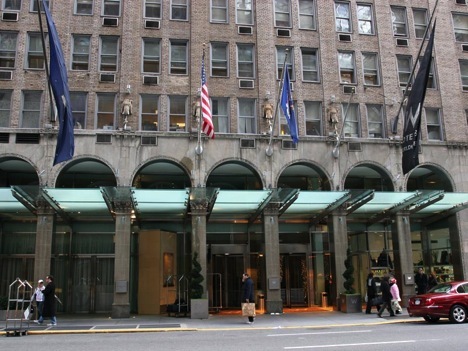 We have a more complete picture of the entire situation, and we can talk to prospective buyers and other professionals involved in the transaction from personal experience. We can speak from the position of having seen the airplane and verified all of the facts personally. In addition to seeing the aircraft personally, we also verify all of the facts, collect reports using several proprietary subscriptions, and use our experience from the hundreds of aircraft we have personally inspected, flown and sold over our many years of experience. 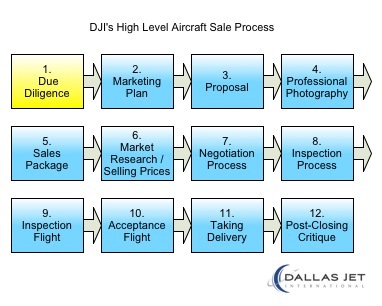 DJI creates a world-class marketing package, including a very specific procedure for setting the best price and acquiring profession photographs that will be utilized and described in future articles. Curious about how DJI’s thorough Due Diligence process might make a significant difference to your situation? Give us a call at 815-520-4009 and let’s talk about it! We frequently mention that our relationships create unique opportunities for our clients. The opportunity to acquire aircraft that are not officially “on the market” is one of those advantages. This quick story of the reincarnation of a fleet business jet from a well-known jet company that became a treasured and highly customized private jet is an example of how that advantage can work for our clients. We regularly purchase well-maintained, professionally flown aircraft from fleets such as NetJets for our clients. 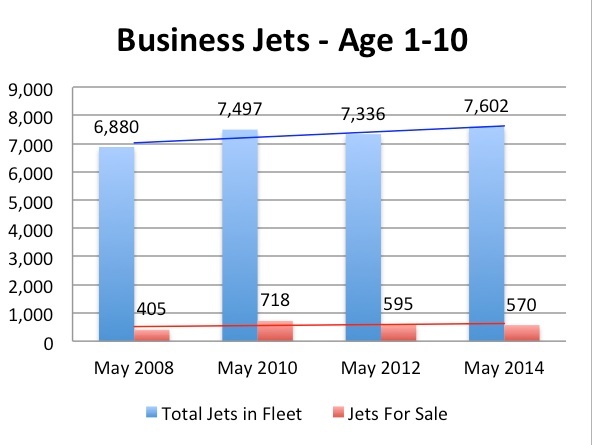 NetJets prides itself on having a very large and very young charter fleet. 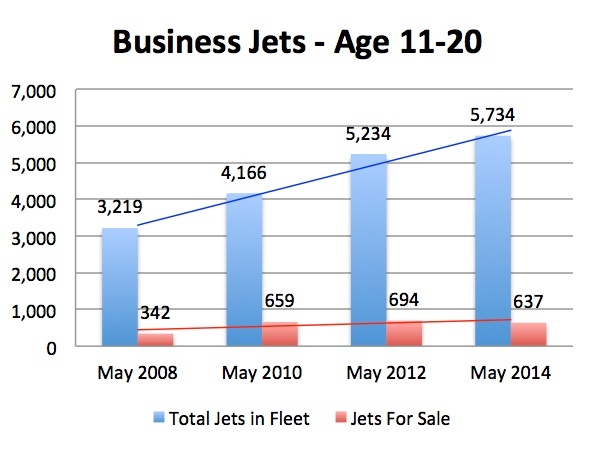 The current average age of charter aircraft in the U.S. is over 15 years, more than double the average age of the NetJets fleet. NetJets is taking delivery of hundreds of new NetJets Signature SeriesTM aircraft entering the fleet in the coming years. The deliveries span every cabin class and will enable NetJets to have the youngest fleet in the sky. While these are often high-time aircraft, the aircraft sale price reflects that. This creates a unique opportunity for private owners to purchase “more plane” with their money. The charter fleet décor is designed to be discreet and neutral. For our clients that want their aircraft to be a mobile office or apartment that reflects their branding and personality, we can arrange for interior, exterior and engine overhauls that create a very custom and beautiful airplane that meets a client’s specifications perfectly. DJI’s relationships with NetJets, our import and export expertise (to acquire aircraft from any location in the world) and relationships with great companies that perform maintenance, paint, interior and avionic modifications and engine manufactures give us the depth and experience we need to make this a seamless and transparent process for our client. Most of our clients that purchase a Netjet aircraft will perform new paint, interior and engine overhauls. Many of our partners, including NetJets, are fellow NARA (National Aircraft Resale Association) members. Our clients, therefore, receive more options and value than they would without our network of resources. Repeat business is the best indicator of success. We have completed this process for several clients over the years, and we’re working with one client again to acquire another “custom NetJets” airplane. This opportunity is best for a person or business that has cash available to purchase and customize an aircraft. Give us a call today at 817-520-4009 and let’s talk about your situation. We’re republishing this article that originally appeared on NARA’s website to promote awareness of the association and its initiatives. Welcome to the first edition of The NARA Perspective from the National Aircraft Resale Association (NARA). Twice monthly, we will share business aviation views and information of interest to aircraft buyers, sellers, owners and operators. The NARA Perspective will be written by industry insiders, journalists and other experts from across the spectrum of business aviation. With this edition of The NARA Perspective, we would like to introduce you to some developments in ongoing efforts to protect the interests of business aircraft buyers, sellers, owners and operators. Perhaps the most significant news are the new standards for aircraft broker and dealer certification that were announced at NBAA2013, the National Business Aircraft Association’s annual meeting and convention. Because there is no governing body to license or regulate aircraft brokers and dealers, anyone with an aircraft to sell and a desire to make money can call himself a broker. Prospective clients never know what they’re getting in the bargain. Their broker/dealer could be highly experienced and honest. Or he could be incompetent and even unscrupulous. NARA Certification assures someone in the market to acquire or sell a previously owned business aircraft that they have found a qualified broker/dealer who will always look out for their best interests, treat them fairly and deliver the fastest transaction at the best possible price. 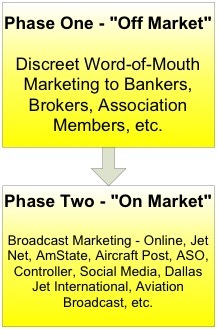 All prospective Certified Aircraft Brokers/Dealers must pass a rigorous application process, demonstrating their reputation for honesty, integrity, transparency, and a commitment to maintaining the highest ethical standards. Certified Aircraft Brokers/Dealers must strictly adhere to the NARA Code of Ethics that guarantees they will always conduct themselves honorably and represent the best interests of their clients. They must participate in our program of ongoing education to remain current on best practices and new developments in order to constantly improve the quality of their services, products and operations. Look for the NARA Certified logo when you search for an aircraft broker or dealer. When you see this emblem on an aircraft broker or dealer’s website, you’ll know that they subscribe to the principles, rules and regulations of the National Aircraft Resale Association, ensuring that you are working with one of the most respected and highly experienced professionals in business aviation. NARA Products and Services Members. In addition the 35 Certified Aircraft Brokers and Dealers, 39 business aircraft products and services providers promise the highest professional quality and best return on your business aviation investment through their adherence to the Code of Ethics. Along with our new direction, we’re introducing a new website to make it easier for you to find a NARA Member: NARAaircraft.com. Just by using your computer or smartphone, you will instantly be able to find a NARA Certified Broker/Dealer or NARA Products and Services Member. You’ll also be able to read the NARA Code of Ethics and NARA Certification process in detail. You can read bios of NARA Member companies and keep up on all the latest news and events from the National Aircraft Resale Association. Find a NARA Member today. And, while you’re at it, sign up to automatically receive The NARA Perspective in your inbox.